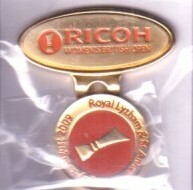 Official metal ball marker coin from the 2009 LPGA Ricoh Women's British Open won by Catriona Matthew. NEW AND SEALED IN ORIGINAL PLASTIC. ONLY ONE AVAILABLE FOR SALE.